The 22nd Annual Interdisciplinary Conference on Entrepreneurship, Innovation and SMEs will be held in Stuttgart from October 11th to 12th, 2018. Lead partners of the FGF e.V. are the University of Hohenheim and the Stuttgart Media University. President of the conference is Prof. Dr. Andreas Kuckertz, Chair in Entrepreneurship at the University of Hohenheim. 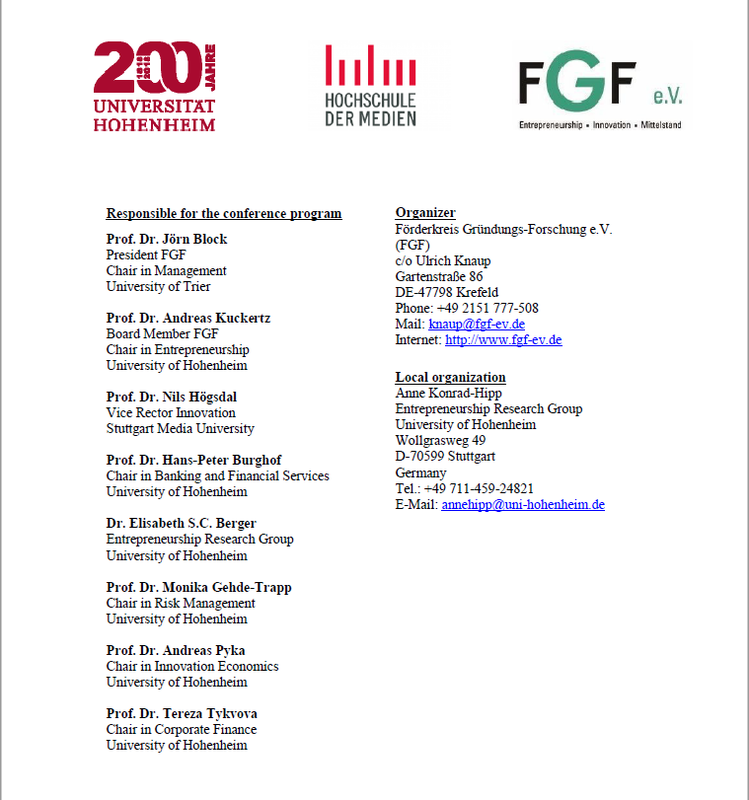 The program of the conference will be enriched by renowned keynote speakers. Digital technologies are currently causing a dramatic transformation of established industries. Entrepreneurs exploit the resulting manifold opportunities to test new business solutions and new business models. As a consequence, established firms such as medium-sized companies need to react to the potentially disruptive competition through entrepreneurial and innovative initiatives. Against this background, the G-Forum 2018 consequently addresses the numerous questions, opportunities and approaches that arise from this challenge for entrepreneurs, established companies and entrepreneurship research. To enhance the exchange between science and practice, submissions „from both worlds“ are expressly desired. Topic-specific sessions are offered which are either based on submissions from science or practice. There are two independent review processes to meet the different requirements for submissions from both realms. In this way, the G-Forum will fulfill its role as a central platform for the scientific community to exchange views on the current state of scientific discussion. It is possible to submit full papers to the G-Forum. Authors of full paper submissions receive two developmental reviews from members of the G-Forum Review Board and qualify themselves for a 20-minute presentation plus 10-minute discussion. However, proposals for presentations can also be submitted as an abstract. An abstract should not exceed 1.000 words. Abstracts qualify for poster presentations, round-table discussions or short presentations (elevator pitches). Please submit your full papers and abstracts in two versions (with and without author details) as a pdf document until May 24th, 2018 via e-mail to submission-gforum2018@fgf-ev.de. Submissions of practical contributions should include a clear starting point, objectives, results and implications for practice. The selection of full papers and abstracts to be presented at the conference is based on a double-blind review process. Only full paper submissions receive a developmental review. The G-Forum review board is responsible for the review process. We will inform the authors about the acceptance of their submissions by the end of July 2018. The conference website is: https://www.fgf-ev.de/en/g-forum-2018-stuttgart-germany/.